Easter Eggs for Boys That You Simply Cannot Miss! 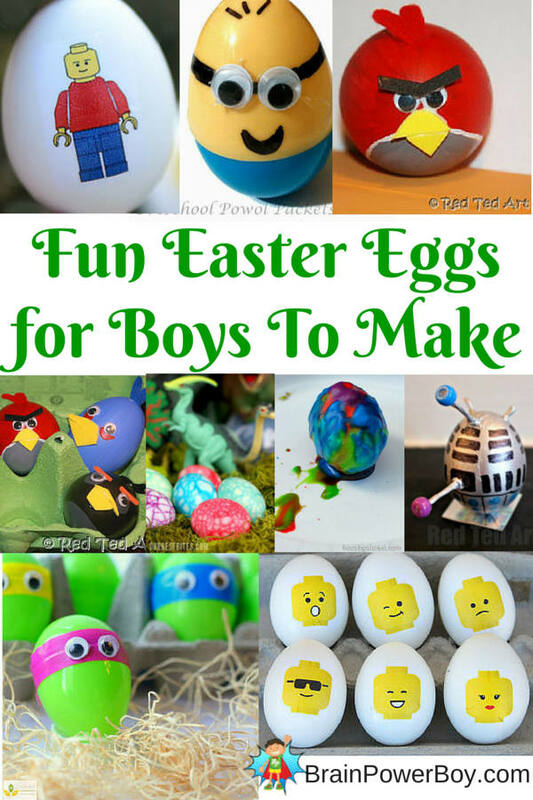 Grab some ideas for making Easter Eggs for Boys and get crafting! As boys get older they have less interest in just slipping eggs into the dye and calling it done. These ideas are just the ticket! Decorating eggs can be one of your Easter activities for boys even as they get older. You just might have to find some egg designs like these. There are a lot of really neat designs out there. I dug around on the Internet for a while and checked with some boys to make sure these passed the “cool” test as well. Oh, you know I love these, right? LEGO Easter Eggs. Super easy and so impressive. They use temporary tattoos. Check out these Star Wars ones as well for more inspiration. Dr. Who Fans rejoice. You can make this Dalek Easter Egg. These eggs are so very colorful and this is a science experiment as well as an egg coloring activity at the same time. Volcano Easter eggs for boys are sure to hold their attention! Stomp on over for some Dinosaur Easter Eggs. These look like a lot of fun. I love how they look when they are done. You could also call them dragon eggs. If your boy is into dinosaurs click here. These Super Mario Bros eggs are hard boiled and then painted but I would likely blow eggs out and use markers instead. It would be much easier for most boys to manage. Go to the site to see the designs. If you want to go with plastic eggs here are two winning choices. Try out some Minion Easter Eggs. Too funny! Do you have a TMNT fan on your hands? Then the Teenage Mutant Ninja Turtle Easter Eggs would be the perfect project for them. These are super easy to make. I hope you enjoyed this collection! I’m sure you will find some Easter eggs boys will like. It was a lot of fun gathering them together. I hope they work to get your boys crafting and as a way to keep them excited about decorating Easter eggs. You can also try our Easter LEGO Designs which includes 2 LEGO Easter Mosaics and a Easter Bunny with basket, and our Easter Basket Gift Ideas for Boys. You could also try this Easter Egg Drawing Challenge. If you would like more fun ideas for boys please sign up for our newsletter today. Thanks for stopping by! FUN! I am really excited to try out the Lego Easter Eggs. Thank you for all the great resources! Thanks Marie, I hope your kids enjoy making them. Such creative ideas! I love the LEGO ones – and the minion is really cute too. Definitely more fun than just dipping eggs when you get older! Fun activity. I think this year we’re going to have the minion theme. 🙂 Thanks for the idea! My son was looking over my shoulder as I read this 🙂 We love them all but the Lego ones are our favorite. Cannot wait to try them out! Super Cait — 🙂 Glad to hear your son enjoyed them too. Yes there are a lot of the minion ones out there this year. Glad you found a favorite. (mine is LEGO) Thank you for pinning–much appreciated! This is such a cool idea. I especially love the Angry Birds style eggs ! Thanks for stopping by and leaving a comment Ashley. The Angry Birds once are pretty neat for sure. I am so glad to hear you can use the ideas. I popped over and added them to your hop–thanks for the invite! Thanks for the comment. There are links to some tattoos in the post too if you want to check those out. I love the Lego ones and the Minions too! Wish we would have seen those when we had our Minion birthday party. These are all so cute. The angry bird one is my favorite. Yay! Thanks so much for making this post your Editor’s Choice Feature. I will be sure to stop by. Thanks for your comment. Of course there are many girls who would like these (I know some!) My site is specifically geared toward boys and I do my best to find things that boys will enjoy and learn from. I appreciate you stopping by and pinning. I absolutely love this post! What a great roundup full of such awesome egg decorating ideas! I really appreciate you stopping by and leaving a comment. They are fun, aren’t they?! These are all awesome! My poor guy usually gets stuck making pink glittery eggs (we’ve got three very vocal girls…he usually just follows along). I’m sure he would love to make some of these! That is funny Kalista. Bet your girls would enjoy these as well! Wow, these are great and not just for boys! My girls would love making Angry Birds and Minions eggs! Thanks Beth. I find things that boys would enjoy because my site is geared toward boys. That certainly doesn’t mean girls wouldn’t like them too. Enjoy! These are too awesome! My boys AND girls would love these. Featuring as a favorite on the next Mom 2 Mom Monday Linkup. Thanks for joining! Glad you like them. Thanks for the feature–much appreciated. These are so imaginative and great fun to engage boys and really cater for them! I appreciate the comment and Thanks for sharing!